As you already know, it is very important to get more and more reviews. But at the same time, it is important to benefit from them, and the easiest way to do this is to share your customer reviews. That’s why we’ve designed one of our greatest features for you – Wiremo Carousel. It provides the easiest and most appealing way to share your customer reviews anywhere on your website. Make your own carousels, adjust them, make them look the same as your website’s design, and place the reviews on any page. 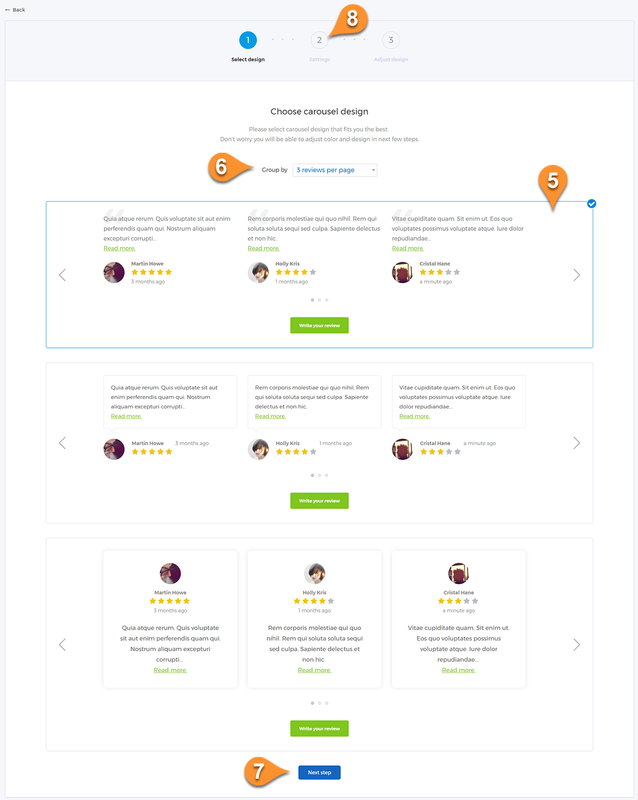 With Wiremo Carousel, you don’t need to hire developers anymore. 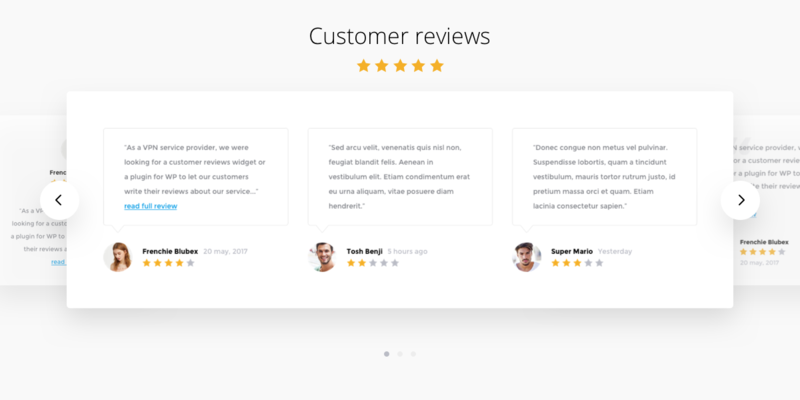 Below we will show you how to make a customer review carousel for your website in just a few clicks. Select the main settings for your carousel. And the most interesting and engaging step – Adjust Design. For an easier way to set up the customer reviews carousel on your website, you can watch the following video tutorial or follow the steps below it. 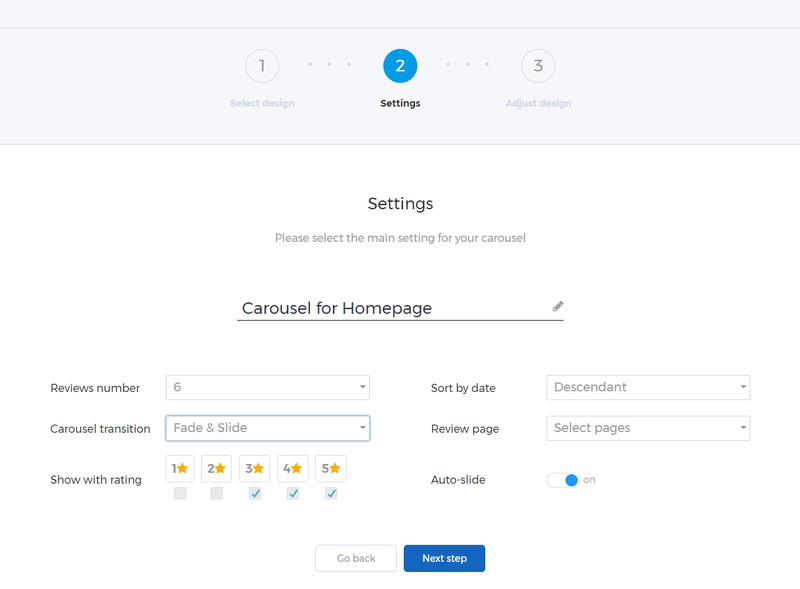 To find the carousels, go to your Wiremo Dashboard. Then click on Tools and select Carousels (pin 1). Here you will find the list of your existing carousels (pin 2). You can edit or delete them (pin 3). To create a new carousel, click on the “+Add carousel” button (pin 4). Now you have to choose the design of your future carousel. We’ve prepared three different designs that can be grouped by 1, 2, 3 or 4 reviews. So, in the end, you have 12 different carousel options. Click on the carousel you like the most (pin 5), and then choose how many reviews per swipe (pin 6) you would like to see. Once you’re done, click the “Next step” button (pin 7) or simply click the step “2” icon (pin 8). Review number – the total number of customer reviews that will be used in your carousel. Show with rating – you can choose the rating of the reviews that will be selected for your carousel. Sort by date – how your reviews will be sorted in the carousel: Ascendant or Descendant. Review page – here you have to type the URL of your customer reviews page or pages if you have an e-commerce platform. Auto-slide – you can enable or disable auto-slide for your carousel. We know how hard it can be to smoothly fit new elements into your website’s scheme. That’s why we’ve created the carousel’s design adjustment step to make it child’s play. You can edit every single element of your carousel. Just put your mouse over any element of the carousel and then select the “Edit” button (pin 9). Now adjust it! To edit the background, find the settings button in the top-right corner (pin 10). If something went wrong, you can always click the “Reset to default” button (pin 11) and start again. Please note that the "Write your review" button is also fully customizable (pin 12). You can edit the button text, link, and color. Once you have finished the adjustment process, scroll down and click on the “Save & Generate code” button. After that, you will get two small blocks with code. The first one, you should copy and paste before your site’s closing tag. And the second one, you should place exactly where you’d like the Wiremo Carousel to be shown. Now you’re done! Thank you for choosing Wiremo.